I like muffins at any meal, but these are particularly good for breakfast because they aren't very sweet and they fill you up at only 135 calories per muffin. The healthy thing about these muffins is the absence of flour, which is nothing more than refined carbs. We should get our carbs from unrefined sources, like fruits & veggies, not from something that's been processed & bleached. 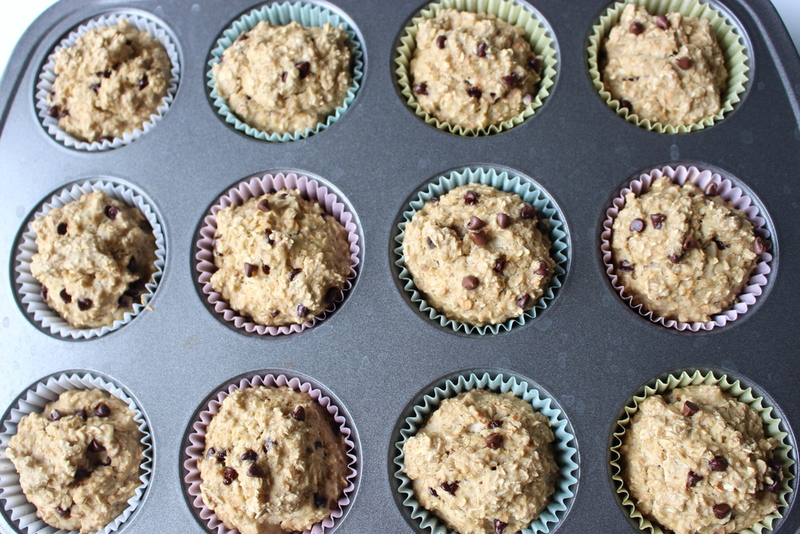 These muffins are mostly made of mashed bananas, eggs, oats & unsweetened vanilla almond milk. I'm not an expert baker so I'm not sure which of those ingredients replaces the flour, but it works! If you want them sweeter, you could add peanut butter or use sweetened vanilla almond milk. The chocolate chips were enough for me. Preheat oven to 350 degrees. In a mixer, combine bananas and milk until smooth. Add eggs, vanilla, baking powder and oats. Fold in chocolate chips. Spoon into muffin pan and bake for 14 minutes. For another healthy breakfast, check out my dark chocolate banana quinoa!